A terror attack near Mian Ghundi in Quetta, Pakistan left several security forces injured or killed. Terrorists opened fire on security forces, while three other terrorists detonated suicide bombs at a checkpoint in a seemingly coordinated series of terror attacks on the Balochistan capital. A police van nearby was also attacked. The Quetta blasts killed five security forces and injured at least fifteen more. Not many details of the Quetta blasts are known. The Inter-Services Public Relations (ISPR), issued a statement confirming that three suicide bombers had targeted a Frontier Corps (FC) post. This attack was thwarted by security personnel, resulting in the death of two of the terrorists. One man opened fire on the security personnel. As the security forces prepared to respond to the attack, the terrorist detonated his suicide vest. As the security personnel approached the dead terrorist, two more entered the scene, but were killed before they could set off their suicide vests. Eight members of the Frontier Corps were injured in the attack. A second attack took place 30 minutes later on Airport Road, targeting a police van. The suicide bomber killed five policemen and injured at least seven others. Pakistani Authorities confirmed that the attacker were suicide bombers, each wearing 8 to 10 kilograms (17 to 22 pounds) of explosives. Police are conducting an in depth search and have cordoned off the area. Quetta is no stranger to terror attacks. Also this week, a female aid worker was attacked in Quetta. 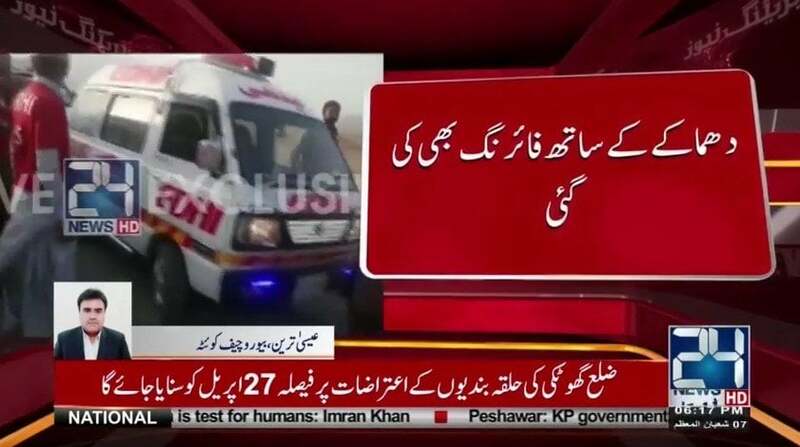 The victim was on her way to administer anti-polio drops to children under the age of five. Men riding motorcycles pulled up and began to attack her with knives before speeding away. The attackers have yet to be identified. In addition to the Quetta blasts, this weekend a gunmen killed two members of the Hazara community and injured one police officer. Another Hazara man was injured earlier this month, leading to protests from the Hazara community claiming the Balochistan government is not doing enough to protect the safety the minority. The Hazara are an ethnic minority that generally adhere to the branch of Shia Islam, making them targets for Sunni terrorist militants. Last week, two Christian men were killed on their way to Church in a drive by attack claimed by the Islamic State. Eight others were injured, some of which are still hospitalized. On April 2, Easter weekend, four people were killed in an attack targeting Christians. Four men of the same family and a young girl were shot dead Monday morning after celebrating Easter with their family. In December, a gunman and suicide bomber attacked a Christian church, killing eight and injuring dozens. In June, a Chinese couple were abducted and killed by ISIS militants posing as police officers. The two Chinese citizens were pretending to teach Mandarin, but in reality were working as Christian missionaries. Overall, in 2017 between 242 and 260 civilians were killed in attacks in the Balochistan province alone. At least 80 terrorists died in attacks as well. In October 2016, gunmen entered the police training facility and opened fire, killing 60 cadets, one of the worst terror attacks in Quetta in recent years. Generally, foreigners need permission from the Pakistani government to even visit Balochistan. Currently, there are a number of Chinese citizens living there working on CPEC projects. The military is said to be spending more than $1.3 billion to protect Chinese personnel working in Pakistan. China has refused to pay a share of the security costs. It is yet unclear which terror group is responsible for the Quetta blasts. No group has yet claimed responsibility. One terror group Pakistan has been battling is the Tehreek-e-Taliban Pakistan (TPP). The TPP has been attacking Pakistan since 2007 in an attempt to impose fundamentalist Islamic rule on the country. Attacks from the TPP have decreased as the military has reduced their stronghold in Northwestern Pakistan. Generally, TPP attacks target minorities in Pakistan such as Christians, Hindus, Shiite Muslims like the Hazara minority, and Sufi Muslims. ISIS has also claimed responsibility for attacks in Quetta, including attacks on Sufi and Shia Muslims. Authorities often question whether ISIS is actually responsible for all of the attacks which they claim. The Asia Times reported Tuesday ISIS has been targeting religious minorities in Balochistan as the terrorist militants vie for control of the region, after bleeding across the border from Afghanistan. Although ISIS routinely claims responsibility for attacks, Pakistan denies there is an ISIS presence in the country. Last year, Pakistan’s army targeted a series of caves outside of Quetta. The army claims these caves were the headquarters of ISIS in Pakistan and were taken out by military helicopters. Many have criticized the government for failing to protect religious minorities across Pakistan.